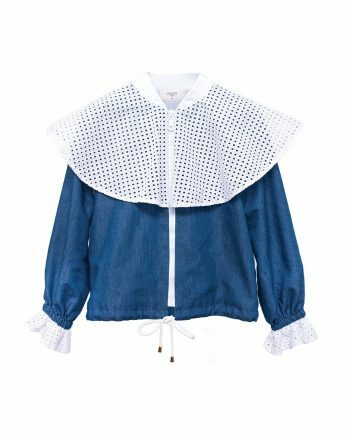 Stunning blue tone refreshed with white embroidered cotton sleeves, Denim Blouse Mer is a must-have for the warm summer days. Pleated detail at the front and button fastening at the back. Complete the look with a flower patterned skirt. Sportswear meets summer romance in Denim Jacket Mer. 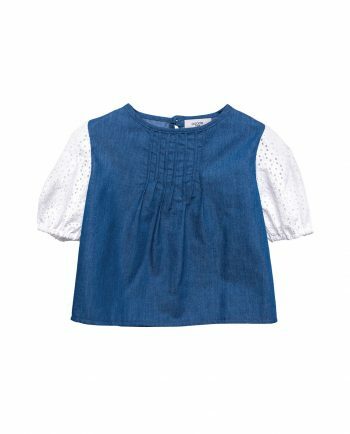 Sea blue denim with gorgeous embroidered cotton flounce and frill detail. Zip fastening and strings. Comfort and ease, a signature Paade item that each girl must have. 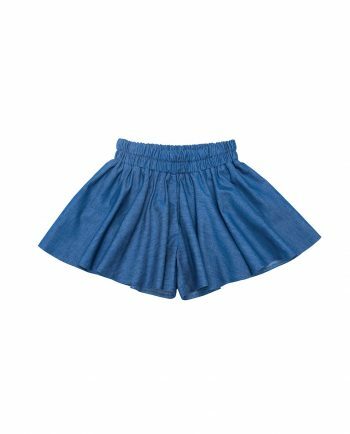 Denim Skort Mer is a pair of flared shorts with elasticated waistline. Easy enough to run in and gorgeous to wear. 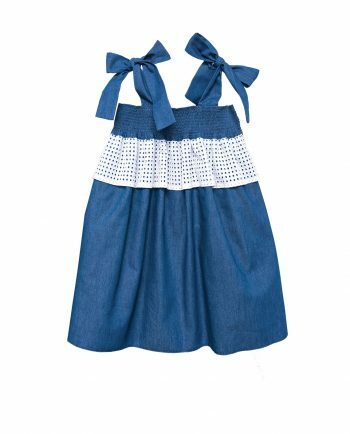 Gorgeous cotton Denim Dress Mer with Bows is the ultimate summer dress. Featuring contrasting flounce detailing, the mid-length dress is perfect for summer. Pair with a patterned cardigan to complete the look. 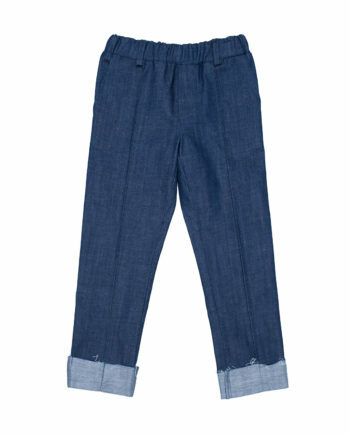 Dark blue Denim Trousers Ronja mix classic cut trousers with an edgy denim look. A slim pant with pleat detail, elastic waistline and untreated flaps. Made form organic denim. Pair with a Merino turtleneck or sweater for a cozy fall look. 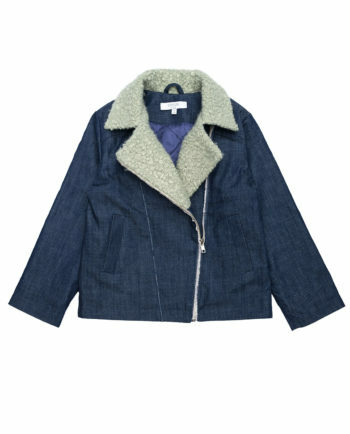 Denim Perfecto Jacket Ronja will finish off your fall outfit in the most amazing fashion! Dark blue organic denim combined with a fake fur collar, lined. Just what a fashionista needs. 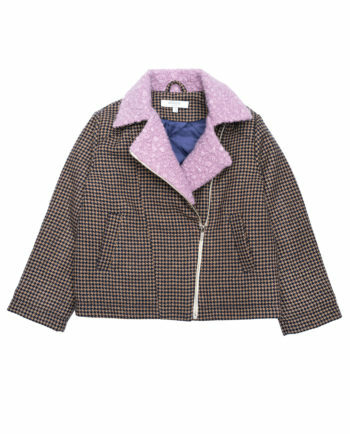 Wool Perfecto Jacket Paddington will finish off your fall outfit in the most amazing fashion! Houndstooth patterned wool blend combined with a fake fur collar, lined. Just what a fashionista needs. 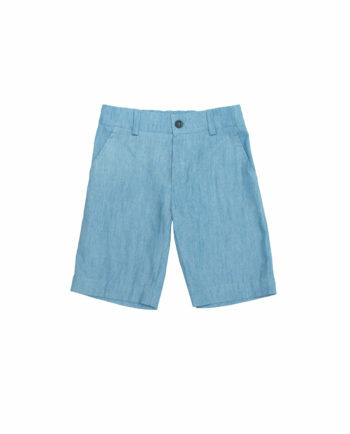 Classic cut Denim Shorts Brunnea for boys. Made from soft denim fabric. Trendy sky blue color. Wear with a tee or a summer sweater. The season must have button down Denim Shirt Brunnea. 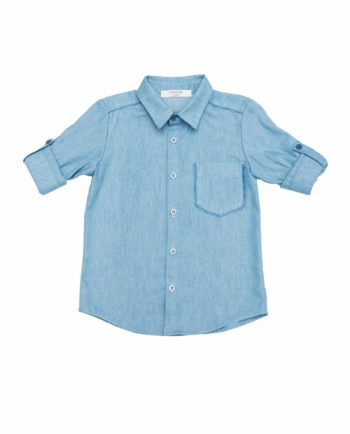 Gorgeous sky blue colour and soft denim fabric. Long sleeves with button cuffs, convertible button-tab closure. Denim Shorts Chia is this season’s must-have Paade item. Gorgeous cut out denim fabric and torn edges. Shorts are lined with white cotton. Pair them with our summery viscose tops. 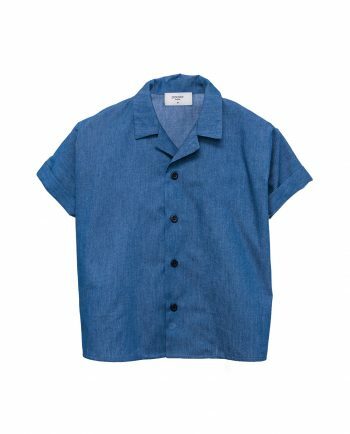 Summer Denim Top Brunnea with generous flounces and torn edge detail. 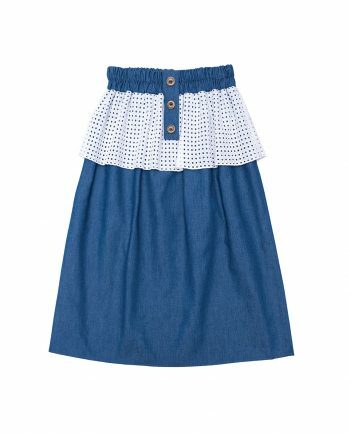 Made from soft denim with button fastening down the front. Wear it with our summer skirts and trousers.